If you remember the old “A Team” series, the lead character’s weekly quote was “I love it when a plan comes together.” When we look at the Bible, as a whole and we see God’s overall plan, from beginning to end, we see that there was always a plan. There was always a plan for God to have a personal relationship with a people He could call His own. There was always a plan for God establish a special place for those in His family, and there has always been a plan for God to walk and talk with those He loves. As we come to the end of this series we catch a glimpse of the future, our future and see that the plan has come together and it is amazing! •What do you think was the main point of Pete’s message? •What do the book of Acts, the pastoral letters and the last two chapters of the Book of the Revelation tell us about God’s plan? •What do these stories say about God? •What do these stories teach us about our personal relationship with God? •What do these stories teach us about what God calls us to do and who God is calling us to be? 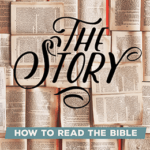 Now that you have an overview of what the Bible is about set up a reading plan. Begin in one of the Gospels and then formulate a plan to spend time in God’s Word on a regular basis. As you read ask your self the questions: “What does this say about God…me…how to be?